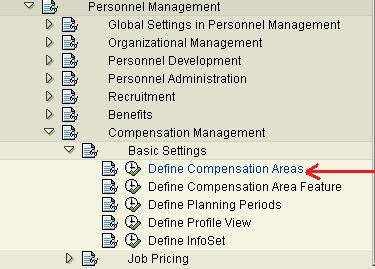 In this step, you define compensation areas to reflect geographical, regional or organizational differences in your pay policy. 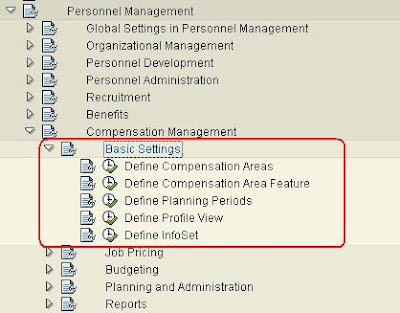 In this step, you define the periods for which you typically plan your compensation. In this step, you determine which evaluation paths the system uses to select the compensation manager, employees, and jobs in an organizational unit. You also specify which subtypes are suggested as defaults for specific infotypes. 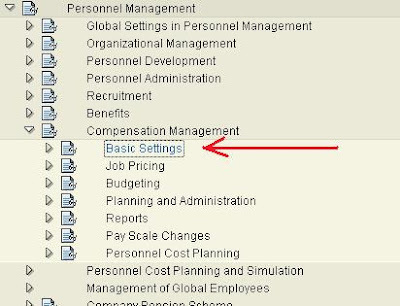 In this step, you define a profile view for the object type P. This basically determines which information is displayed in the employee information dialog box. In this step, you define your compensation areas. Compensation areas group employees for compensation administration purposes. The attributes used for grouping employees can be geographical, for example, country and region, or they can be organizational, for example, department and subsidiary. 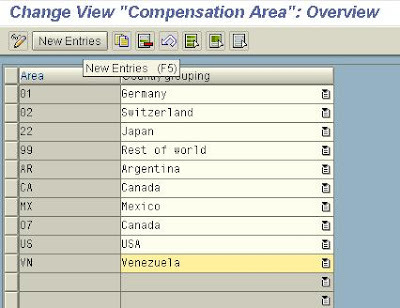 Compensation components and adjustments have wage types, therefore a compensation area can only be assigned to one country grouping. 1. Determine the different compensation areas that you need within your organization. 3. Enter a two-character identifier for each compensation area. 4. Enter a description and a country grouping for each of your areas.